AB: [now at the door, opens to a barbershop quartet] All right, fellows, hit it. Now that is called harmony. Each part an individual, but completely in sync with the whole. That’s what I want out of a stew. This is homogeny, as in, homogenized. As in boring, like that stew over there. So, can we produce a stew that sings a nice C-major 7? Suppose I were to ask you to define the word “stew”. You might say, "a shortened version of the Scottish name “Stuart”, or “to dwell on something, negatively”. But you might also offer, “a dish composed of chunks of meat and vegetables, cooked and served together in a flavorful and potentially thickened liquid.” And you know what? You’d be right on all three counts. 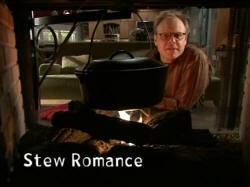 Of course, you might also say that it is the verb “stew”, the traditional cooking method by which "a stew" is produced. But if you ask me, the key to "a stew" isn’t stewing, it’s braising. And although braising is indeed related to stewing, there’s some significant differences. Stewing involves cooking small pieces of food. Braising calls for large pieces, which limits surface area and therefore limits moisture loss from the target food. Unlike stewing, which calls for submersion of the food pieces in liquid, braising calls for a relatively small amount of liquid. That means less chance of producing watered down flavors. Remember, water is a solvent. Stewing, often achieved in an open vessel. Braising calls for a tightly-lidded vessel. That prevents moisture loss via evaporation and helps to tenderize meat through the slight elevation in vessel pressure. And perhaps most importantly, while stewing always calls for cooking ingredients of different natures together, braising applications often call for separation of meats and vegetables. And that makes braising the precision choice, even when the desired dish is a stew. Let’s prove the point. Here are some of the more popular stews from around the world: boeuf bourguignon from France, Hasenpfeffer from Germany, wat from Ethiopia, Brunswick stew from America. If you have your “Good Eats” interactive remote, just go ahead and vote for one. I’ll wait. Go ahead. Go ahead. Wow, Hungarian goulash. Well, that is certainly a classic of the form. Well, let’s find some eats, shall we? [take the back off the cow model and pulls out a clear plastic model of the cow showing the skeletal structure] There. this is a little bit better. Now as you can see, ribs 1 through 5 are in the chuck area and the ends of ribs 6 through 12 are in the plate. Although there isn’t much meat to speak of on 9 through 12, the front plate ribs render some nice meat. But for my money, and we’re not talking about a lot of money here, the chuck ribs provide the best mixture of meat, fat, and connective tissue. When it comes to buying short ribs, we have choices. How many? Let’s find out. AB: [to the butcher] My good man, I require some short ribs. BUTCHER: All right. Would you like chuck or plate? AB: Gee, I don’t know. What do you think? B: I don’t know. What are you going to use it for? B: Ahh, then you want plate. It’s got more connective tissue, so it’s better for slow cooking. Now, would you like whole, English style, or flanken? Oh, he’s really opened up a can of worms now. AB: Gee, I don’t know what that means. Educate me. B: Well whole, clearly, is one whole rib with the meat cut parallel to the bone. English style is just half of that. Flanken is a cross cut that contains the meat of several different ribs. AB: Very nice. Now what would a cook do with something like that? B: Most of the ones that I sell end up as Korean short ribs. B: Oh yeah. Marinate that in soy, ginger, garlic, and green onion. Grill it hot and fast. Oh, it is good eats, if I don’t say so myself. AB: If you don’t say so myself. Um, well that sounds great. But I think I’ll take three pounds of the English cut. Now, keep in mind that a standard English cut rib is going to weigh about a quarter of a pound. We’ll lose nearly a half of that weight during the cooking process. So, you’ll want to plan on a minimum of two pieces per diner. Or in the case of me by myself ... er ... four. B: Here you go, Sir. AB: Thank you very much. Say, how do you like yours? B: Oooh, I like to slowly smoke and grill mine while lightly brushing them with a mead reduction. AB: Wow, you ever think of having your own cooking show? Now heat is a big deal here. You’re going to want to park your griddle over high flame for at least three minutes before bringing the meat to the party. If you cook on electric, it’s going to take five. Sorry, just the way it is. Now this is not going to seal in juices, okay? But it is going to create a huge amount of flavor. There is at this very moment, a symphony of chemical and physical changes going on involving amino acids, proteins, meat sugars, and about six kajillion other things. It would be pretty much impossible to actually name all of the substances involved. Which is why we simply refer to this entire process as the Maillard reactions, after the famed French chemist who first investigated the phenomenon. French, go figure. Anyway, the searing is going to take several minutes on each side, which gives us plenty of time to concoct a braising liquid. No, I mean, a paste. of unshuffled cards to produce some very strange hands. Hey, it sounds like we’ve hit Thing’s Ingredient Of The Day, paprika! AB: Get out of my face! ... dried sweet peppers, such as Capsicum annum, into a fine powder. A native of South America, pepper plants first arrived in Hungary around the 17th century courtesy of refugees of Balkan states escaping the Turks who were actively marauding at the time. By the late 18th century, paprika was firmly ensconced in Hungarian cuisine. Now as to types, “hot paprika” isn’t so much, you know, “chili” hot, as it is simply pungent. “Sweet” paprika isn’t so much sweet as simply, not pungent. The most commonly exported variety is called “noble sweet”, although smoked varieties are gaining popularity here in The United States. Now since you have to buy it in ground form, you’re going to want to keep it very very tightly sealed in a cool place, and you’re going to want to replace it every eight months, give or take a month. Now when your paste is thoroughly whisked and the meat is thoroughly browned, toss one into the other. Now, I’m aware that this is not exactly a braising liquid. But it is flavorful, it is thick enough to stick, and once the juices start running out of the meat, there will be liquid aplenty. Now let’s talk for a moment about containment. You know, the word “stew” comes from an Old French word, estuve, meaning “stove” or hot enclosure. And French cooks, understanding how important it is to keep moisture in, used to seal up their dry estuves or daubes, with a homemade library paste that they would chisel off when the multi-day cooking was done. Now since it’s easily shaved, tight sealing, and a fine heat conductor, I believe that heavy-duty aluminum foil would be the first choice for a braise like this. Now I know what you’re thinking. You’re thinking, "Well, cooking tomato products in aluminum is insane because the acid dissolves the metal." Well, you’re right. A few little aluminum ions may slip out of their normal place. But it would take a very, very long time for that leaching to reach anything close to a toxic level: months, probably. Now, if you really want to see aluminum dissolve, watch this. If you cook or store something containing a lot of acid, say, tomatoes, in a steel, or better yet, a cast iron vessel, and cover it tightly with aluminum foil so that the foil is in contact with the acid, well, you’re making a battery. And in no time, the aluminum will erode and pit wherever it is touching that acid. Since our braise doesn’t involve two metals, which is key, I’m not very worried. [looking at eroded aluminum foil, covering a dish] That’s gross. Now, a tight seal is important. So crimp all the way down one side and then crimp up both of the ends, nice and tight. There, that ought to do the trick. [hears rapping on the window] Why look, we’ve got company. AB: [at the window] Hi. FRENCH CHEF: [presenting trays of diced aromatic vegetables] Monsieur, we are ze aromatiques. In most culinary traditions, braising meats never face the heat without a backup team of aromatic vegetables. From France, we have mirepoix: two parts onion, one part each carrot and celery. Up the ante with parsley and garlic, and you’ve got an Italian battuto, which is close to a Spanish sofrito. Now the Chinese are partial to ginger, garlic, chilies, and scallion. All of these combos are meant to form flavor platforms on which braises can be built. But you know what, I don’t buy it. I don’t. AB: Hey, hey, hey, hey. Back off there, big guy. FC: What right do you have to spit in the face of tradition? AB: What right do I have? They’re my groceries! AB: Bye bye. Bye bye. Well, now that we have that out of the way, we can get to cooking. Our little bundle of joy goes in a cold oven. And I’m going to slide a little pan and set [it] under it, just in case there’s any dripping. We will set for 250 degrees. Now the total cooking time is going to be right at four hours. But I want to just take a look at it every hour or so, so I’ll set my favorite timer to sixty minutes. Why will it take so long to cook? Why do we use such a low temperature? Patience, grasshopper. Sofrito is Spain’s aromatic blend of onions, green peppers and garlic. Well, the cooking is now halfway over and everything looks fine. You may see a little bit of dripping in there—even if you did properly seal your foil pouch—simply because the pressure can build up to the point that it will pop a little hole to escape. And that’s fine. So, what’s really going on in there? Well, you see, the unctuous body and lip-smacking goodness of braised meat is made possible by a curious chemical characteristic of a particular tissue type common to all mammals. In your body, right now, there are three major types of connective tissue holding you up and together. For instance, we have elastin. [represented by a mesh work of bungee cords] These fibers make up tough, gristle-y stuff like cartilage. We’ll see a little bit of this later. Not a lot of culinary use there. Another one is called reticulin or reticular fibers. [represented by a honeycomb drying rack] They are very, very fine, and form the outer skins of things like your lungs and kidneys and what-not. They’re not good eats. Then there is collagen. [represented by an opaque plastic sheet] Now our muscles, bones, tendons, and such are all held together with this stuff. Collagen is, well, it’s really the glue that holds us together. Now here’s the strange and wonderful part. When exposed to water and long, low heat, collagen molecules break down and rearrange to another protein structure called “gelatin”, which makes most glues possible as well as a host of classic desserts. Not the least of which these delicious little gummy [he holds up a gummy work] ... er, later. The key to this magical conversion is heat control. And although many many braise and stew recipes call for simmering long and low on the cook top, the truth is, even a top-notch burner makes a ring of fire, and there is no way to control a braise with a ring of fire. Nope. The tool that we want to use is, the oven. This is the only safe spot. We can control the temperature in here and count on the heat to come at the food from all directions. Since air conducts heat much slower than water, the meat will heat slowly, and that will give us maximum collagen-to-gelatin conversion without overcooking the meat. everything from glue to guitar strings to contact lenses. [opening the oven door] Time’s up, my luscious lovelies! Now, our little metallic parcel here doesn’t just bear one precious commodity, but three. That’s right, there is the meat, of course. But there’s also the liquid and the fat that cooked out. So we want those badly. They are full of goodness. I’m just going to open up the end of this and let that drain out [into a bowl in the sink]. Aluminum cools down pretty quickly. Ahh, there we go. Now the meat, we want to cool. So I’m just going to move that up to a cooling rack and we’re going to leave it here on the counter for an hour to cool down. Oh, don’t worry. The food police aren’t going to come busting through the window or anything. Just, you know, don’t throw raw chicken on top of this. Now take a look. You can see that the meat is very, very soft. It’s almost like pulled pork in there. We’ve had complete collagen to gelatin conversion. But when this cools for an hour, and if we refrigerate it after that, we’ll see that this is going to change. More on that later. Now this liquid, we need to get into something that’s a little easier to handle. So I’m going to drain that into this beaker and then we will move this to the refrigerator. [later, at the refrigerator] Well, that’s what we’re looking for. No, not that. [moves aside a container revealing the beaker with the beef fat separated from the broth]. That. That nice solidified disk of highly flavored beef fat which has settled on top. And just use a little knife and pop that right out. Now if it doesn’t solidify properly in your refrigerator, you can always stick it down into the freezer for a little while. Wipe off the bottom, and you’ve got yourself a super-high-powered culinary hockey puck which we are definitely going to make use of now. [picking up the broth remains] Oh, you too. Hah hah. As late as the 19th century, a stew referred to a sauna or brothel in England. [now at the refrigerator] Now would be a good time to retrieve our meat. Now take a look. You’ll notice that it has firmed up considerably. In fact, it’s downright hard. Why? Well, gelatin, of course. You see, as the gelatin cools ... well, come here. Autry’s [sic, Autrey's] Armory, Inc.
See, as gelatin cools, it moves from a suspended colloidal state to a gel state, which if concentrated, can be quite strong. This, for instance, is ballistic gelatin, about an eight to one ratio of water to gelatin. Crime labs use this to study the impact of bullets and other projectiles have on, well, us. Huh. W: ... loaded with 230-grade, jacketed hollow-points. AB: Perfect. Well, I’ll tell you what, Wes, take a bite of some Jell-O down there. Obviously, this stuff is tough. And that is why our meat gets pretty hard when it cools down. Now, what’s really interesting, though, is that once gelatin has reached the gel state, it takes more heat to re-dissolve it than it did to render it from collagen in the first place. And, believe it or not, that is a good thing. Since bone and gristle are never good eats, unless you’re a rabid dachshund, they have to be removed before we add the meat to the final stew. Now the bone, well, that’s easy enough to find. And odds are they’ll just pull right away. The gristle, that’s going to cling to the meat. It’s not so easy to get off. And that’s why I use these little guys [kitchen shears] to just snip that away. Easier than a knife. Now you could certainly serve these chunks intact. But I’d rather snip them down into bite-sized pieces. Now this would, of course, be impossible had we not cooled the meat, because there wouldn’t be enough solid gelatin to hold the meat together. I’ll tell you, when it comes to stew, time is your friend. Okay, just put the meat on top of the veggies—don’t stir in—re-cover, and heat, well, just until the meat is hot again. It’ll take about ten minutes. Ahh, the meat is perfectly heated through, but it’s not falling apart. That’s because we let it cool down before reheating, and that is why stews, braises, fricassees, and blanquettes are always better the second day. As for the potatoes, well, I’ll admit, they’re not a standard goulash guest. But I do like the textural counterpoint, and the starch seems to thicken things up a bit. Of course, if you’re after more of a traditional American stew, you could add a little beef stock, some cut up carrots and some peas, and, well, you’d be right at home on the range. Either way, it’s a stew, it’s a science lesson, it’s a meal. And it’s abso-tively [sic] good eats. (Hungarian) Goulash: a spicy dish, originally from Hungary, usually made of beef, onions, red peppers, and paprika powder. Its name comes from Hungarian gulyás (pronounced goo-yash), the word for a cattle stockman or herdsman. Peperonata: an Italian stew, the term means "sautéed sweet peppers"
Waterzooi: is a classic stew of Northern Belgian, its name is Dutch meaning "watery mess"